Exquisite, well appointed and welcoming vacation home in the heart of LLV! Why stay in a cramped motel, or overpay by hundreds of dollars at a resort when you can have the whole house to yourself? 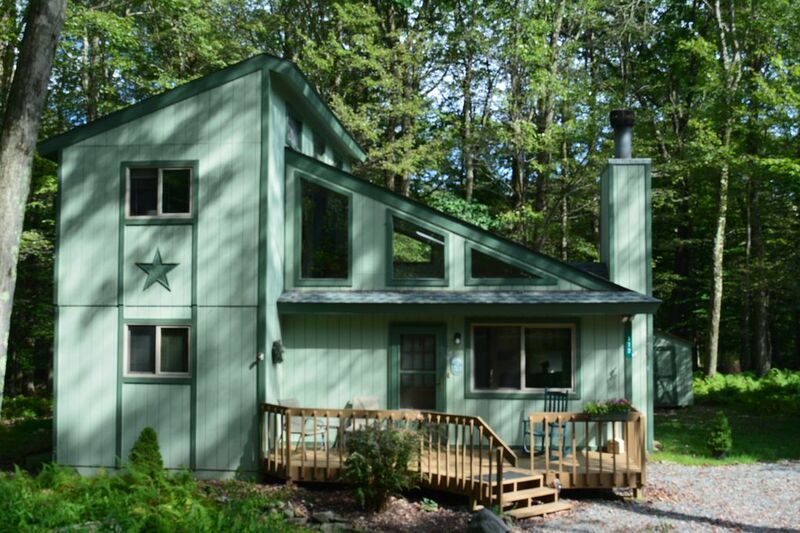 Whether you are looking to swim, boat, bike, hike, hunt, ski or simply enjoy the quiet and clean mountain air, you and your party will find everything you need on Tommy's Lane. Three bedrooms plus a sleeping loft, along with two full baths, will be spacious for a family of four but perfectly sized for up to eight guests. IS THIS PROPERTY NOT AVAILABLE FOR YOUR DATES, OR ARE YOU LOOKING FOR SOMETHING COZY AND WITHIN WALKING DISTANCE TO THE BEACH? Check out our other property in this area, The Chalet at Pines Lake, HomeAway listing 4045897. The house is newly listed for Fall 2018. The home is well appointed, with a careful attention to detail that can impress, amuse, and create a comfortable atmosphere. Check out the pics to see the plush furniture, huge dining room table, and full laundry center. Two full sized beds and two single sleigh beds are all equipped with pillow toppers. The loft features a sleeper sofa and a Wii system with a variety of games. The living area features plush microfiber sofas, a propane fireplace, a smart tv with complimentary Netflix, and a variety of lighting options including skylights. Out back, enjoy our deck for outdoor meals you can cook on our propane Weber grill. Or sit out by our fire pit or chimenea. We are continuing to upgrade both the indoor and outdoor spaces, and you will enjoy seeing the new features every time you return. Our home is a perfect balance of location, price, and amenities. You can see Pines Lake from the upstairs window. We are also centrally located to most major Pocono attractions. In addition, the community of Locust Lake Village has much to offer. Spend the day boating, swimming, and sunning at Pines Lake beach, or visit the village Chalet for daily activities for the whole family. There are four lakes with lifeguards, concession stands, bathrooms and playgrounds are available as well as weekly activities. Basketball and tennis courts, and baseball and soccer fields are nearby at East Lake. In the winter, enjoy the village's two ski slopes or the sledding hill. Wristbands are required and available at the main office. Winter is the time when most people think about the Poconos. The village has its own ski slope and sledding hill, as well as ice skating and ice fishing when the lakes are frozen over. Or you can venture out to nearby Jack Frost, Big Boulder, Camelback, or other famous ski and tubing destinations. There are over 185 trails in the area. Check in at the village office when you arrive for wristbands, discounts, and current conditions. Then again, there's nothing wrong with building a fire in our soap stone stove and curling up under a big blanket with your favorite beverage! Spring is perfect for wildlife watching, and a great time to rent while crowds and rates are low. Outdoor activities awaken with blooming foliage and moderate temperatures. It's a great time for hiking, biking, birdwatching, boating, picnics, and golf. Spend a fall afternoon hiking or sightseeing and relax at night at our fire pit. The Chalet has everything you need for your family vacation. The summer brings with it all the Poconos has to offer, including cool evening temperatures and clear skies in the mountains. Lakes, rivers and waterparks are numerous. Adventure seekers will want to check out zip lining, whitewater rafting, and adventure courses. Concerts, festivals, and fireworks are constant in the area. At night, relax at our fire pit and enjoy stargazing away from the city lights. Beautiful colors and low crowds highlight the fall season. Check out the changing mountain scenery with tours, hikes, or train rides. Our chalet is a great base for hunting, boating and fishing excursions. Or spend your time touring nearby wineries, fairs and farmer's markets. There is so much to do year round in the Pocono Lake area. A short drive takes you to major ski resorts, championship golf, hiking, and adventure. Split Rock, Jack Frost, and the newly expanded Kalahari indoor water park are 15 minutes away. Experience the excitement of the Pocono Raceway, the Mt. Airy Casino, Camelback Resort or travel to Scranton or Wilkes Barre for sporting and cultural events. The area also features numerous farmers markets and antique shops, as well as outlet shopping. - We offer special discounts to our military personnel. Thank you for your service! - Please note that primary renters must be at least 25, and we do not rent for graduations, post-proms, or senior week. We are excited to offer this new listing to the rental community. Tommy's Lane is one of the best and most beautiful streets in Locust Lake, and we know you will have a fun stay! When you're ready, send us an inquiry, or take advantage of HomeAway's Instant Booking feature. Thank you for your interest in our home! Craig and Sue Ann Snyder are music teachers who live in Garnet Valley, PA. We love the outdoors and find that Locust Lake Village has everything we are looking for. As soon as we saw this house, we knew it stood out from the crowd. A clean and inviting contemporary, it has the perfect combination of location and amenities for a wide variety of renters. We take great pride in our home and love every decoration, upgrade, and piece of furniture we have added. We hope you do too. Four separate sleeping areas is a rare feature for a house of this size. The two full baths will accommodate eight guests easily. The property is priced to be a great value for families, extended families, or two families traveling together. The combination of rustic and contemporary is evident in the amenities. You can relax outside in the cool mountain air or sit and enjoy the warming propane fireplace. Or if you prefer, have a Wii tournament in the loft or enjoy complimentary Netflix on our 4K smart tv. Or unplug and play one of dozens of board and card games we have prepared for you - just please don't lose the pieces! Your wristbands give you access to Locust Lake Village amenities. Stop in the main office to pick up information on what's happening from week to week. Very spacious! I loved our stay here. Exactly as advertised! Clean, everything works and a great location! We will rent again! Spent a long weekend with family to go skiing at Camelback. Property is exactly as Craig and Sue advertised. Spotless. Everything you would ever need for a weekend and everything worked as advertised. Close to Jack Frost, Big Boulder and Camelback ski areas. Lots of choices for eating out nearby. Lots of other things to do as well - Casino, Water parks and lots of breweries and wineries. Grocery store & a CVS just a few minutes away for everything we forgot. Locust Lake is a great community, even has a ski slope! We're going to plan another trip when the lake is not frozen! Thank you again Sue and Craig for a great get away weekend and all the hospitality. We look forward to renting from you again. From the moment we stepped in the door, we knew this was home. my husband and I and our two children and their spouses and little ones were so very comfortable in this house. They had everything that you would need, except for your food. A warm fireplace to sit around and make memories added to the cozy feeling of the warm blankets in every room. Can't wait to return to the peace, solitude and of course the deer! Would highly recommend it to everyone looking for Family Fun Fond Memories! This property has the warmth and character of home. It was in immaculate condition and the owners were very responsive to our questions and concerns. Location was perfect and the community amenities were great. All in all, it was perfect for our family. From our many getaways this house was by far more cozy. It has absolutely everything that you would need for a weekend stay especially with the kids. Owners are super friendly and VERY accommodating. Loved it and will be renting in the future. It is a very clean, cozy and warm house. Everything you need for family getaway including full kitchen, games for kids, TV with Netflix, private deck with grill, excellent location.